Below is a write up of Magic-Flight from the folks at VaporNation. They understand what it is that the people love so much about Magic-Flight. Read VaporNation full blog post here. 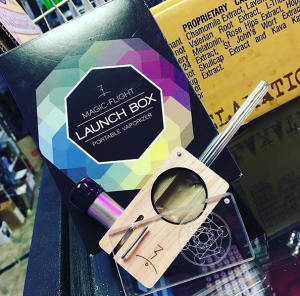 Just like the automobiles shipped out of Detroit’s GMC factories during the thriving days of the motor city, Magic Flight’s Launch Box is made and assembled in the good ol’ USA. With a carved wood body, hand-crafted by artisans based in San Diego, the design has remained largely unchanged since the inception of the first Launch Box portable vaporizer. While it may not feature LCD screens or space-age materials, the Launch Box vape excels at its one true function, vaping, with reliability and ease of use. This is the perfect portable vaporizer for those used to more traditional means of dry herb consumption. The handcrafted wood offers a nice feel in the hand, and the operation is unrivaled in its simplicity. The unit consists of the box with a heating element and a battery, to use, simply push the battery until it clicks and you’re ready to vape. The units are guaranteed for life, to offer extra peace of mind when buying and feature easily replaceable components to ensure usage is never interrupted due to a small malfunction. There’s a sort of mythos and almost cult-like following that surrounds the Launch Box. From the quotes which are printed on the every unit to the unique design and dedicated community, this is a vaporizer which offers an unparalleled level of communal appeal for the user. This might be cheating, but Magic Flight’s entire line of vaporizers consists of two similar but very functional vapes, each engineered for specific purposes. The original Magic Flight is optimized for dry herb vaporization and handles the purpose with aplomb. The Muad-Dib is the newest iteration of the Launch Box vaporizer, featuring a heating chamber and brass rails which function at a higher temperature, to extract all the essential vapors from your concentrates and waxy oils. This entry was posted in Aphorisms, Behind The Scenes, Products, Uncategorized by Magic-Flight. Bookmark the permalink.